A cozy bed for violets. Chanel eyeshadow duo in Sable-Emouvant; Chanel Rouge Allure Velvet lipstick in La Romanesque; Chanel Duo Tweed Effect blush in Rose. Today’s violet lippy is more vibrant. It makes more of a statement, but a sweet and–dare I say?–romantic one. I’m really fond of the Rouge Allure Velvet formula–not quite fully matte, not quite satiny, the formula feels light, the finish is softly luminous, and the color payoff is impressive. I wanted this particular version of it, RAV in La Romanesque, to play a prominent role in this look. Rather than go for a very understated eye, as I often do with a strong (or strongish) lip, I thought it would be nice to play the eyes up a bit more in this look. It is, after all, for Valentine’s Day! I mulled over a number of possibilities for the eye look. I thought a flick-y liner might be pretty (and I still do)–in classic black, maybe, or maybe in a plummy-chocolate-y shade like Bobbi Brown Black Mauve. But I’ve been enjoying smoky hazes of color around the eye this winter, so I thought about–hey! what about a taupe smoky eye? But no. I’ve already done that. Twice now. OK, how about black, then? Black smoky eyes are smoldering hot! However…..black shadow would be a lot of look against my ghostly pallor this time of year. Gray? Well, I’m going to start sounding like a broken record here, but I try to avoid using very cool colors on all my features. (To me, placing cool tones on every feature somehow puts my makeup at the forefront of my overall look–the makeup enters the room before I do, in other words. While I think that’s great if it’s the desired effect, it’s usually not what I’m going for.) In the end, to play up the eyes while providing a good companion or frame, if you will, for the violet lip, I finally settled on brown. Now: what kind of brown? I didn’t want to go for a brown that was too golden or caramel, because I was looking for a little contrast between cool lips and warmer eyes–not a lot of contrast, at least not this time. I wanted a look that was warm and toasty on the eyes but still in harmony with a sweet, cool-toned violet lip. So I dug up one of my Chanel eyeshadow duos, Sable-Emouvant, which features a soft champagne-peach shadow and a brown one shot through with purple and–I believe, after careful inspection–the barest hint of green. Almost a…greeniness? That hint of green always sort of surprises me when I see that shadow on the skin. I’m not sure why I expect it to be different. It just looks more red to me in the pan than green. That said: in real life, there is also a hint of purple shimmer in that brown. Is that a hint of green I see before me? 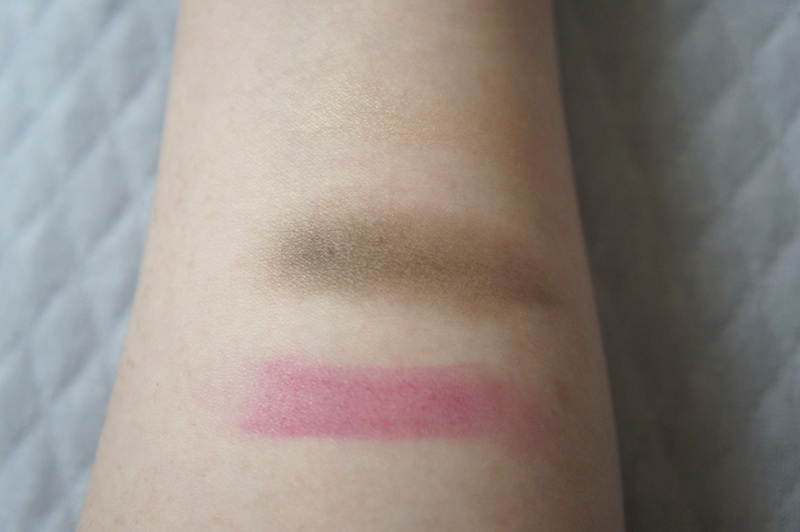 Top and middle: Champagne-peach shade from Chanel eyeshadow duo in Sable-Emouvant (barely visible); brown shade from Sable-Emouvant (is it a little bit green??? ), and a quick swipe of Chanel RAV in La Romanesque. For cheeks, I thought a nice, soft, balanced rosy shade would be a good bridge between a brown smoky eye and the violet lip. 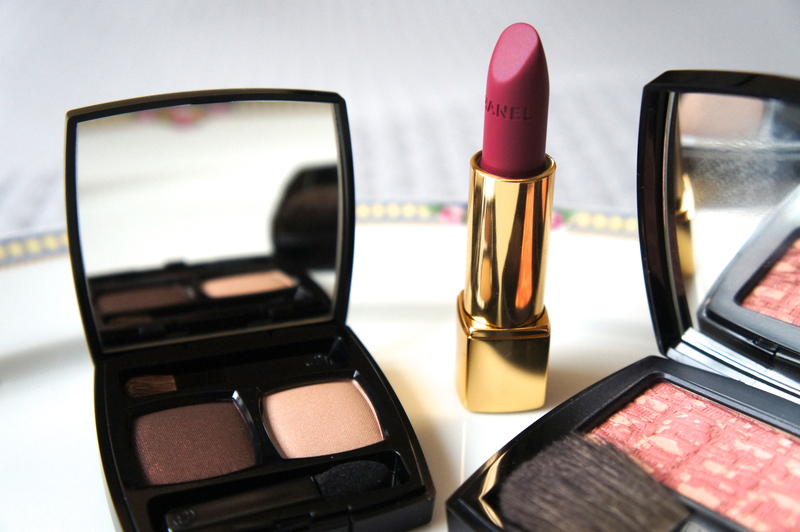 Without giving it much thought, I seized on the opportunity to use my Chanel Tweed blush in Rose. These blushes give such a nice effect, with just a hint of shimmer. So in with the look it went! I realized when captioning these photos that this look is kind of thick with Chanel products, one of which (the blusher) has been discontinued, and another (the lipstick), limited edition. I thought it would be a good idea to propose some options. A perfectly lovely alternative to the Tweed blush would be Chanel Joues Contraste blush in Rose Petale; L’Oreal TrueMatch blush in Rosy Outlook would also be very nice. As an alternative to the Chanel lipstick, I actually sort of had my eye on MAC Rebel. It might give a somewhat different effect, but…I do love it. And that’s the product set for the Toasty, Smoky, Sweet Valentine’s-Day Look. I’m preparing a post that shows the look as I interpreted it on my own face, so I’m looking forward to sharing that soon! In the meantime, I wish you all a lovely day. Thank you so much for your kind feedback, and for reading Beauty Reflects! I’m just delighted to hear that you’ve been enjoying the site. Every time I hear from someone that they’ve liked something, it just makes me want to work harder! And it truly is a labor of love. I’ve met so many wonderful people–and everyone has been so incredibly encouraging. I’m looking forward to developing lots more content for the site the days ahead. Please do stay in touch and let me know what you think when you can!